Team Brunel (Bouwe Bekking/NED) emerged victorious in the final act of the Volvo Ocean Race 2014-15 today in the Inmarsat In-Port Race Gothenburg (full story below). GOTHENBURG, Sweden, June 27 – Team Brunel (Bouwe Bekking/NED) emerged victorious in the final act of the Volvo Ocean Race 2014-15 today in the Inmarsat In-Port Race Gothenburg. Behind him there was major drama in a race for connoisseurs of in-shore racing as MAPFRE (Iker Martínez/ESP) outwitted Team Alvimedica (Charlie Enright/USA) in the final few moments of an intriguing race. By pushing the Turkish/American boat wide to allow Dongfeng Race Team (Charles Caudrelier/FRA) to slip in ahead of them (see panel above), MAPFRE ensured that they broke the tie for fourth place on countback overall, which they were sharing with Team Alvimedica after nine months’ gruelling racing. Abu Dhabi Ocean Racing (Ian Walker/GBR) earned the six points they needed to win the overall In-Port Race series by edging out last-placed Team Vestas Wind (Chris Nicholson/AUS), who have suffered in the shorter races after re-joining the event in Lisbon. 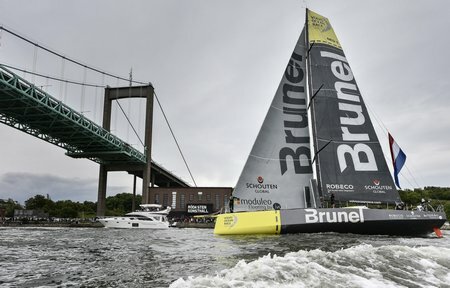 They finished just one point clear of Team Brunel in the standings. On Monday, Ian Walker’s crew had claimed the overall offshore trophy – the main event – with five points to spare, also from the Dutch crew. Team SCA (Sam Davies/GBR) sailed a canny race today to claim second place in the Inmarsat In-Port Race Gothenburg, and with it the third place on the podium for the in-port series, behind Ian Walker’s crew and Team Brunel. Two royals had front row seats. His Majesty King Juan Carlos of Spain was on MAPFRE, and Victoria, Crown Princess of Sweden, joined Team SCA. Both would have appreciated more than most, the intricacies of such a tactical tussle in near windless conditions. International footballer Freddie Ljungberg (SWE) also joined Abu Dhabi Ocean Racing for the race.